FACT: The track 'I Palindrome I' features a 27-word palindrome as its bridge: "'Son, I am able,' she said, 'though you scare me.' 'Watch,' said I. 'Beloved,' I said, 'watch me scare you, though.' Said she: 'Able am I, son'". I'm hoping the script of Apollo 18 found space to squeeze that line in out of respect. FACT: While making this album, They Might Be Giants were asked by NASA to be Musical Ambassadors to International Space Year in 1992. They said yes. OPINION: While 'Apollo 18' boasts great songs like 'Dig My Grave' and 'Turn Around', it's not their best album. That would probably be their previous effort, 'Flood'. 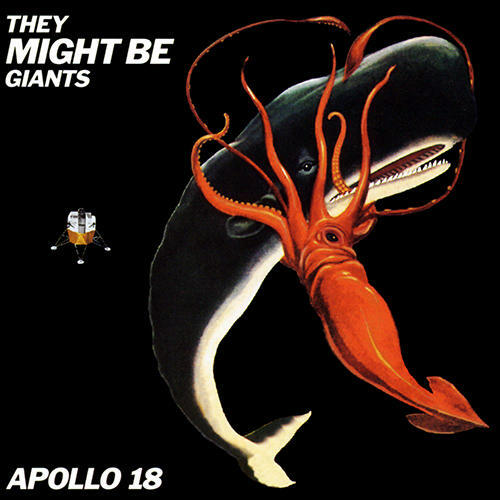 OBSERVATION: The cover suggests that if TMBG were going to name their album after a future movie, it probably should have been Megawhale vs. Giantfuckoffsquid In Space. That's a movie, right? Well it should be. I can't believe you didn't mention Dinner Bell. For shame.